Pay attention to how much sleep you've gotten before you get behind the wheel. Twenty per cent of traffic fatalities are blamed on driver fatigue. To help educate drivers about the dangers, Ford has developed a sleep suit to simulate what happens when you're overly tired. It consists of offset weights that are attached to an ankle and wrist along with a heavy weighted vest and headgear with added goggles to mimic micro sleeps. "You'll lose consciousness, you'll doze off for a few seconds, could be a second, could be three or four seconds," explained sleep expert Alena Krizek. CTV News was invited to the Vancouver Auto Show to experience the sleep suit firsthand. The goal was to walk in a line looking straight ahead and follow signs indicating when to stop or go. The weights make you feel heavy and off-balance and every once in a while the goggles, controlled by someone with an app, go dark, making it difficult to follow the signs. "It's a real danger," Krizek said. "Your eyes could be open but effectively you're actually not cognitive," Krizek explained. Slapping your face, rolling down the window to get a blast of cold air, yelling and turning up the radio may jar you awake momentarily but it won't solve the problem. If you find yourself in that situation, pull over and take a nap for at least 20 to 40 minutes. If you're a passenger, it's your job to help keep the driver from getting too tired, especially at night when accidents due to drowsy driving are three times greater. 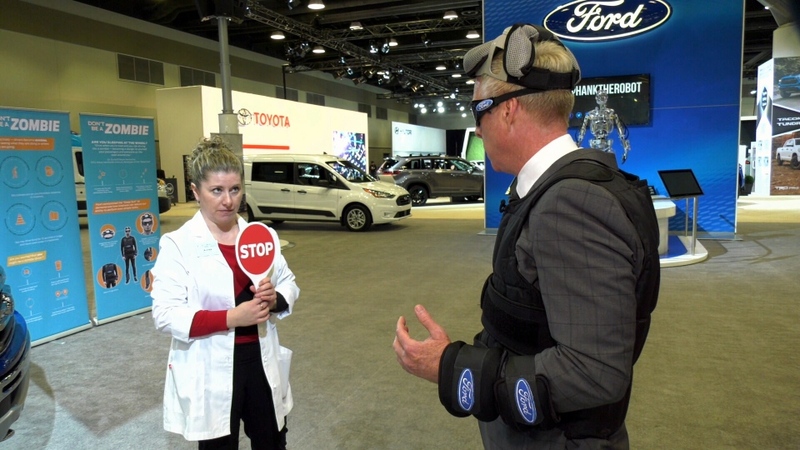 Sleep expert Alena Krizek demonstrates Ford's Sleep Suit to illustrate the dangers of drowsy driving.